According to the (ISC)2 2018 Global Information Security Workforce Study on Women in Security, women occupy only 24 percent of information security positions across the globe. Booz Allen is working to change that. This March, Booz Allen is hosting a series of conversations for Women’s History Month. In this installment from the Courageous Conversations Video Series, Talent Acquisition Manager Susanne Goett talks with Talent Acquisition Leader Patricia Porter about turning risks into rewards, being your authentic self at work, and the importance of leadership role models for women in the workplace. Highlights follow. At Booz Allen, Porter is a leader with the African American Forum and mentors young professionals. In this capacity, she advises colleagues to find advocates and ask for help, especially in new situations. Sometimes asking for help can lead to difficult—but valuable—feedback. Porter recalled a time early in her career when she was adjusting to a new role. She was so caught up with preparation and getting acclimated that a colleague told her she appeared unapproachable. 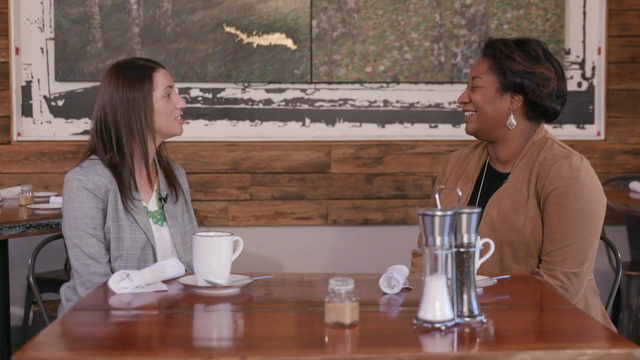 Watch the full conversation and learn more about the Courageous Conversations Video Series and diversity and inclusion at Booz Allen.